The Hitachi Freedom Storage™ Thunder 9500™ V Series, sets a new standard for modular storage products. With the same set of APIs, software tools and management framework as the Lightning 9900™ V Series, the Thunder 9500 V Series storage systems offer virtualization, flexible configurations, and intelligence for ease of management, plus high performance in a small footprint. 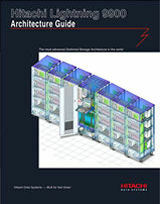 This Product Guide is 78 pages with 29 color illustrations, a cover, title page, glossary and 9 Tables.